Lobster Clambake Dinner for Three! Home > Mother's Day Dinners! > Lobster Clambakes! 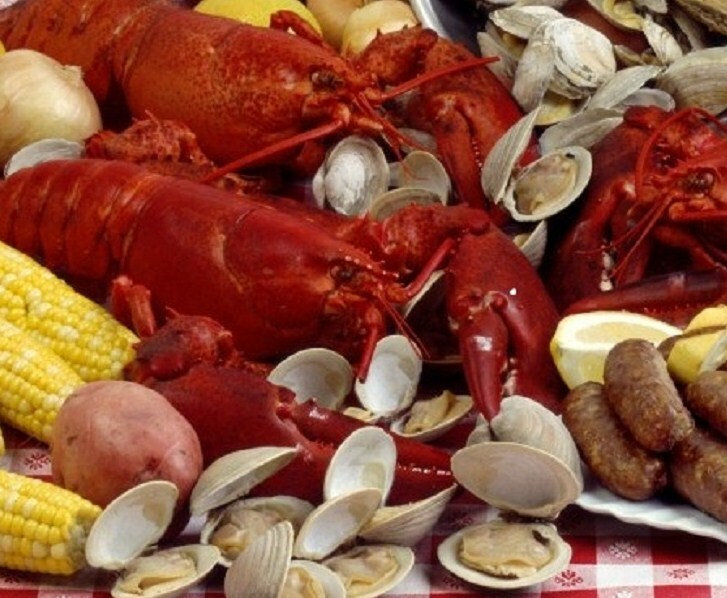 > Lobster Clambake Dinner for Three! Enjoy one of our most popular items, one that will get both of us rave reviews! The Lobster Clambake for Three! 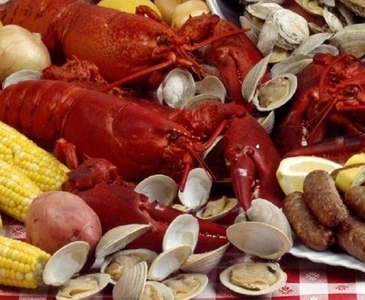 This traditional lobster clambake dinner is sure to please any seafood lover! Upgrade Your Lobster Size! • Lobster Clambakes! • Surf & Turf Dinners! • The "Mariner" "Romantic" & "Extravaganza" Lobster Dinners! • Three 1-1/4 pound Live Maine Lobsters; • Three Quarts of Little Neck Clams; • Three pieces of Sausage Wrapped in Flounder Fillet; • Three Servings of Red Potatoes, Sweet Potatoes, and Onions; • and Three pieces of Corn on the Cob! It's all in its own cooking tin with instructions and also includes Three complete Lobster pick sets! Order This Incredible Lobster Clambake Dinner For Three By 10 am Today, And We'll Ship It To You Overnight In Time For Dinner Tomorrow, Right In Your Own Home! Great Lobster Dinner! We could not get over the quality and how much of it there was! Great Deal all the way around! Childhood Memories brought to life. I lived in New England most of my life and every birthday I would go to Kennybunkport, ME and would have a lobster bake with all the goodies. I got the lobster bake dinner for three but I think they made a mistake because there was sooooo much food in it that we will be eating lobster salad tomorrow and then making a meal out of the rest of the stuff the next day. It was delicious. Everyone was smiling. It tasted like my childhood it was so good. Thank you very much for the memories. Born, raised, still living in the upper midwest. I know my meats and cheeses, along with beer... But I will tell ANYONE this, online, or to their face :D It's food like this that makesme either want to pack up and move out that way, or get a higher paying job so I could order more often. No joke here, this food is so amazing (to myself and my family anyways) that I swear, change jar, extra ANYTHING - ALL goes towards our next purchase, which we ALL hope will be SOON.... If not, I swear the wifey is going to have me get ANOTHER job JUST to fund her newfound obession with seafood. Just finished my first lobster bake from you. The neighbors had me over for turkey dinner on Thanksgiving, so I ordered a lobster bake and had them over to get over turkey day. The food arrived as advertised, on time and fresh. I followed the directions, and we sat and visited while it steamed, then sat around and ate for 45 minutes. It was all perfectly cooked and delicious, and quite a treat for us landlocked Texans. There is food leftover for later, and we all had all we wanted. Great job, guys. This one one of the best seafood dinners we ever ordered! We could not fiish all the food in it, and it was just like a real clambake on the beach, with no sand loll! thank you so much it was great. There are many things I miss about New England but the seafood is up there on the list. I ordered The Clambake and upped the lobster size. I also ordered the Romantic Dinner for Two for another of my sons. My son is raving about his Clambake! Even with a carrier issue which delayed delivery by a day, the food was perfect. He and his fianc loved it. I will definitely buy from The Lobster Guy again!!! Thank you. We cannot tell you how pleased we were with your products! Best Lobster Dinner online period! We will order again. thanks again, Fred Jacksonville Fla. This was a very good dinner. we had it for my sons birtday dinner, it's all he wanted. Now he wants to work on the boats with you, problem is, he's only 12! "Our experience with the Lobster Guy was excellent. From ordering on line, to the customer service who answered our questions quickly and friendly, to the unbelievable clambake that was delivered to our door on time. The lobster was fresh (alive) and we couldnt believe the amount of food we had in the pot. The meal was awesome and worth every penny. We will order from them many more times to come and tell all our friends about them." Sylvia S., Canon City, C.O.